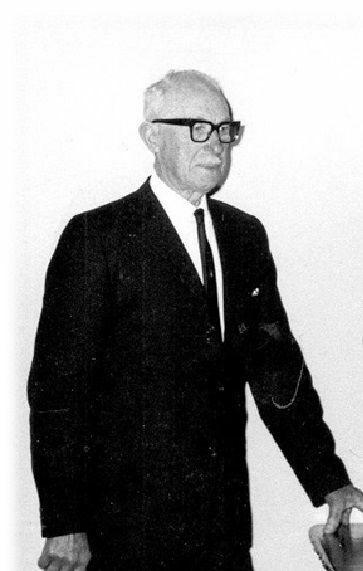 SEMMENS, Dr Edwin James, M.B.E., F.L.S. | Business & Tourism Creswick Inc. Known to his friends as E.J., Teddo or Jacko, Dr Edwin Semmens was an educator, local historian and community leader. He was born on the 20th January, 1886 at Toongabbie, Victoria, the eldest of nine children of Josiah Semmens, storeman and later Inspector of Forests, and his wife Agnes (nee Veitch), both Victorian born. Educated at the Maryborough School of Mines, Ted became a State primary school teacher in 1902, aged just sixteen. He studied part time at the University of Melbourne, gaining a Batchelor of Science in 1925, and won the (Godfrey) Howitt natural history scholarship in zoology. As recreation, he played tennis and golf. On 8 May, 1915 at Armadale he married Florence Bilton, a teacher. They had no children. While teaching at Shepparton High School in 1927, he was invited to become Principal of the School of Forestry, Creswick. This appointment was seen as a challenge, with the school at such a low ebb it was in danger of closing. Introducing a broad curriculum for the three-year residential course, he set high standards and made himself available outside normal working hours to guide the study habits and interests of his exclusively male students. At a time when relatively few Australians were interested in preserving their country’s historical records, Mr Semmens collected letters, diaries, reports, account books, photographs, paintings, publications and objects relating to the history of the region around Creswick, Allendale, Smeaton, Bloomfield, Clunes, Daylesford, Ballarat and Eaglehawk. Although he published little, E.J. Semmens ‘saw relationships between the different types of documents long before others were aware of them’. He was the principal advocate and contributor in the founding of the Creswick Museum, to which he gave part of his collection, providing a solid basis for its archives and for its establishment. He donated the bulk of his collection however to the archives at the University of Melbourne. Occupying some 61 meters of shelving, this gift to the University has been described as ‘one of the most important collections of local history source material assembled in Australia’. In 1977, the University conferred on Semmens a Doctorate of Forest Science honoris causa for his contributions to forestry and history. E. J. Semmens was also a Councillor (1951-75) and President (1956) of the Shire of Creswick. It was said he ‘loved nothing better than a good debate’ and ‘was happy to keep talking’ until it was time for a scotch. In 1968 he was appointed a Member of the Order of the British Empire (Civil) for services to Local Government. Prominent in a number of community organisations, he also presided (1948-51) over the Creswick District Hospital board. As a scholar, scientist, historian, councillor and leader, he was the epitome of academia in combination with community interests in Creswick. He and Florence created a beautiful garden at their home on the town’s Eastern Hill. Predeceased by his wife, he died on 31 December, 1980 at Creswick and was cremated with Anglican rites. With grateful thanks, the writers acknowledge the adaptation of much of this citation from the 2010 publication Circumspice, and the Australian Dictionary of Biography.